[Pickersgill Palliser, printer and Postmaster of Harrogate, does a job for Harrogate Workhouse.] Signed Autograph Receipt ('P. Palliser') on his printed business letterhead, for work done for 'The Overseers of the Poor | Bilton-w-Harrogate'. On the business letterhead of Pickersgill Palliser, Post Office, High Harrogate [Yorkshire]. January 1839. For information on Palliser, see his obituary in the Harrogate Herald, 8 August 1883. 1p., landscape 12mo. A nicely-printed period letterhead: 'To PICKERSGILL PALLISER, Dr. | PRINTER & PUBLISHER | OF | The Harrogate Advertiser and Weekly List of Visitors. | Bookwork, Circulars, Cards, Posting and Hand-bills, and every other description of Letter-Press Printing, executed neatly, on reasonable Terms. | Books bound in plain, neat, or elegant Bindings, in the best style of Workmanship. | Orders for Advertisements and for Town or Country Newspapers duly executed. [ The Bolshevik Revolution and the American Engineering Corps with the Russian Railway Service (American Expeditionary Force Siberia). ] Eleven Autograph Letters Signed from George Fainstone in Russia to his wife Helené [ in England ]. Between 20 March 1917 and 14 September 1918. One on letterhead of 'American Engineering Corps with the R. R. S. [ Russian Railway Service ]'. From Tomsk, Odessa, Vladivostok and other parts of Russia. As part of American involvement in the Russian Civil War, the Russian Railway Service Corps was formed by President Wilson to operate the Trans-Siberian Railroad. Details regarding the author are sketchy. In 1929 the London Gazette reported the naturalisation of 'Fainstein, Yosel (known as George Fainstone); Russia; Upholsterer and Furniture Manufacturer; 16, Ravenscroft Avenue, Golders Green, Middlesex. 20 August, 1929.' Fainstone died in England in 1956 and his wife Helene six years later. 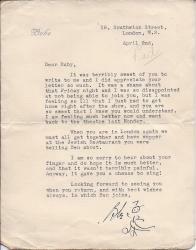 Ten more of his RRS letters, all dating from 1918, are in the Imperial War Museum. [Braes of Lorn, Argyllshire.] Manuscript 'D[ra]ft. Regulations for Braes of Lorn', regarding the duties of tenants. From the papers of John Campbell, 4th Earl and 1st Marquess of Breadalbane. On letterhead of Glebe Field, Stoke Newington. 5 November 1881. gb3pp., 12mo. Bifolium on mourning paper. Very good, on lightly-aged paper. He thanks her for the 'kind idea': 'My own dear girl is a talented & modest student: and some day may have to turn this to account. She is full of Music, and tho only 18 is the most reliable critic I know: always comes to a true & high conclusion.' He asks her to lend the girl her collection of sheet music, 'and then allow me to pass it on to some one else, when I meet with a fit recipient.' He was 'sorry to "lose" you in my lectures. I have a tolerable Cl I & a very good Cl II -'. [Printed anti-Vietnam War handbill.] "October 27th March to U.S. Embassy." 'Issued by: OCTOBER 27 COMMITTEE FOR SOLIDARITY WITH VIETNAM | 1, Temple Fortune Mansions, London, N.W.11.' [Printed by Fermaprint Ltd., 17 Fleet Street, E.C.4. '], 1968. Printed in black on one side of a piece of 32 x 20.5 cm paper. Fold mark. In good condition, lightly aged and worn. Illustration of Viet Cong holding up an AK47 in top right-hand corner. Dense text beginning: 'The heroic People's Liberation Armed Forces and the people of South Vietnam are trouncing the Americann aggressors, the main enemy of the people of the world.' Sections headed: 'PEOPLE'S VICTORIES IN SOUTH VIETNAM', 'BRITISH IMPERIALISM - U.S. STOOGE' and 'FALSE SOLIDARITY AND ACTUAL BETRAYAL'. Slogans at foot of page: 'U.S. Two Typed Letters Signed from the Hollywood actress Bebe Daniels, wife of Ben Lyon, to 'Ruby', the variety entertainer Rubye Mae Colleano, mother of the film actor Bonar Colleano. Letter One: 24 October ; Queen's Hotel, Leeds. Letter Two: 2 April [no year]; 18 Southwick Street, London. 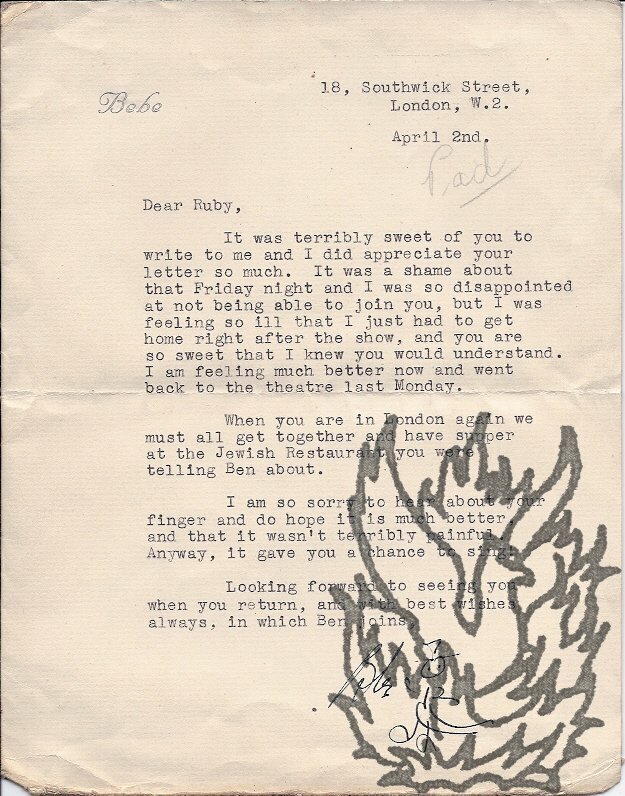 Both items on 'Bebe' letterheads, and both with signature 'Bebe' incorporating a drawing of a stick figure with hat. Letter One: 12mo, 1 p. Twelve lines. Good, on lightly-aged paper. With addressed envelope. She is sorry they missed one another 'at the station, especially after all the trouble you went through to get there'. Gives news of show: 'Boy, it will be good to get back to town again. | I have enjoyed the tour but as you know travelling nowadays isn't what it used to be, by a long shot.' Letter Two: 8vo, 1 p. 21 lines. Printed document, filled in in manuscript, ordering the induction of Thomas Hutton into the 'Rectory and Parish Church of Beeston Saint Laurence'; together with printed and manuscript certification. Two pages, dimensions roughly thirteen inches by eight inches. Discoloured, creased and folded, with several closed tears. Papered seal of office of the Archdeacon of Norfolk. Signed by Henry Francis, deputy registrar. On reverse a printed form, filled in in manuscript, and signed and witnessed, by which John Gunn, vicar of the parish of Banton Turf with Instead, certifies Hulton's induction. Autograph Letter Signed to 'Mr. W. Blanchard'. One page, 4to. Very good, though on discoloured paper, and with traces of grey-paper mount adhering to blank reverse and minor damage at foot affecting one word. Reads 'I am favored with your Letter of the 1st. instant, enclosing One Guinea subscribed by Rudston Calverley Rudston Esqr. Sunday [no date or place].